The equity markets have modestly quieted relative to last month’s daunting volatility, accompanied by plunging consumer confidence and a brief pullback in hiring. However, despite ongoing concerns regarding consumers’ and corporate America’s reluctance to enter a full expansion phase, two closely watched measures of economic health soundly beat expectations last week. These positive readings come on the heels of stronger than anticipated job gains in September and upward revisions of employment for the prior two months, suggesting current conditions are better than previously believed. The Philadelphia Fed Business Outlook Survey strongly rebounded following two months of negative readings. 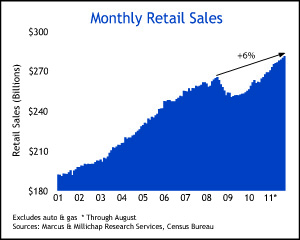 Similarly, September’s retail sales posted the strongest monthly gain in seven months — an unusual divergence from the Consumer Confidence Index, which remained largely unchanged since August’s free fall. The October Philadelphia Fed Survey suggests the manufacturing sector is on stronger footing than implied by the negative readings of the prior two months. Nearly all components of the major categories posted strong increases. In addition, the six-month-ahead index reached its highest reading since May of this year. The survey’s broadest indicator for general manufacturing conditions reversed from negative territory, climbing 26 points. The index for current new orders and shipments similarly posted strong gains, rising 19 and 36 points, respectively. Employment conditions firmed, although companies maintain a heavy reliance on temporary staffing, similar to the broader employment market. Approximately 46 percent of respondents reported the overall workforce had increased compared with 24 percent reporting a decrease. Retail sales rebounded strongly in September, rising 1.1 percent for the month and 7.9 percent measured on an annualized basis. About half of this strength is owed to surging automobile sales of 12 million units, which, as a discretionary purchase, signals improved confidence in the economy. In addition, strong upward revisions to sales data from the prior two months complemented sales improvement across most categories. In perspective, retail sales, ex-vehicle sales and gasoline revenues posted a 0.5 percent gain, on par with August. The supply-chain disruptions created by the Japanese tsunami have largely settled, contributing positively to both the Philadelphia Fed Survey and the sales rebound in vehicles, primarily because they are rising off such low inventories. In addition, higher vehicle prices likely influenced retail sales since lean inventories in prior months drove higher prices. Thus, while the improved performance is a welcome change, it does not yet establish a trend. The gradual momentum shift in improved consumption and business optimism bodes well for industrial properties, particularly in markets with high exposure to technology, energy, trade and manufacturing. Rising leasing activity generated a 70-basis-point decline in vacancy over the past year to 12.1 percent. The monthly effective rent of $4.17 per square foot as of 3Q 2011 remains 18 percent below the 2007 peak, and represents a 12.9 percent discount to asking rents. The office sector also demonstrated a strengthening trend as professional and business services hiring has outperformed the broader employment market. Over the last quarter, office properties recorded a surge in net absorption of nearly 6.6 million square feet, a major turnaround compared with a net loss approaching one million for the same period last year. The national vacancy rate declined 20 basis points from third quarter last year to 17.4 percent. Asking and effective rents stand at $27.85 and $22.39 per square foot, up 1.3 and 1.6 percent, respectively, on a year-over-year basis. This entry was written by marcusmillichap, posted on October 24, 2011 at 4:29 pm, filed under Research, Uncategorized and tagged research. Bookmark the permalink. Follow any comments here with the RSS feed for this post. Trackbacks are closed, but you can post a comment.